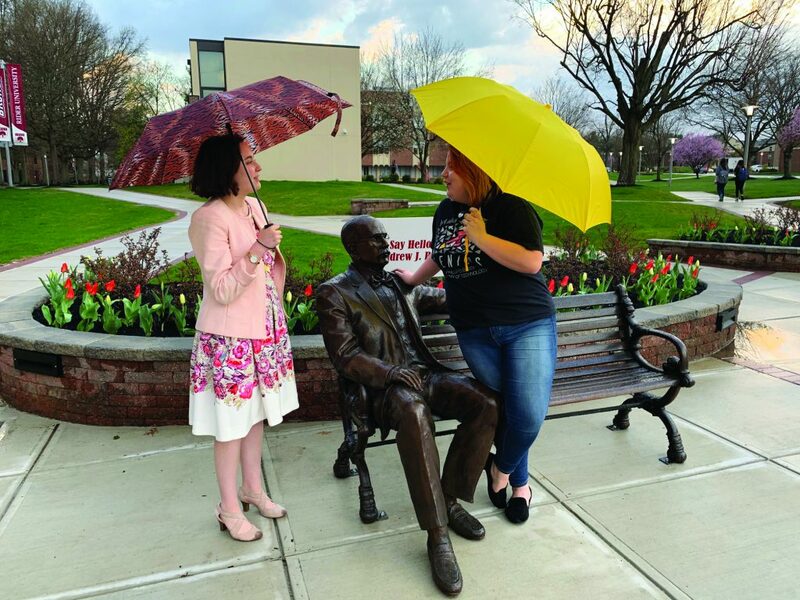 Freshmen arts and entertainment industries management major Jamie Hafner (left) and public relations major Hailey Hensley (right) enjoy a rainy afternoon conversation near the new Andrew J. Rider statue and bench, located outside of the Bart Ludeke Center on April 9. Students who have walked past the Bart Ludeke Center (BLC) anytime within the past week may have noticed an interesting new addition to Rider’s campus. This addition is a bronze statue of Rider’s first president, Andrew J. Rider. He is depicted relaxing on a bench posed in a friendly manner that invites students to come and take a seat with him. The statue became a social media hit as students were encouraged to take selfies with the statue and post them. Rider shared several of them via their official Instagram account. This sparked interest in many students as they wanted to see the statue for themselves and take their own pictures with Andrew J. Though it may have come as a pleasant surprise to students, this statue also has a unique donor behind it. It was donated to the campus by the Student Government Association (SGA). Senior Class President and senior communication studies major, Olivia Battinelli, said there were two main motivations behind the purchase of the bench and statue. “[It] was to increase school spirit and give a little nod to the history of who Andrew J. Rider was, and why he is a main part of Rider,” she said. The implementation of this statue gives a face to the campus’ namesake, serving to inform students about the history of their university. “Andrew J. has been connected to our school traditions including, Cranberry Fest, Cranberry Court and, now, a physical statue will continue to connect the students with the history of our first president,” said Olivia Barone, SGA student body president and senior environmental studies major. The statue was placed on campus just in time for Rider’s Admitted Student Day event on April 6. It provided a chance for prospective students to familiarize themselves with Rider’s namesake and also have fun sharing photos with the statue. Andrew J. Rider’s statue has a lot of potential and may even play a part in future campus events. Battinelli hopes the statue will be included at Rider’s campus traditions, including the freshman orientation program. “It would be perfect to be able to continue the take-a-selfie tradition with Andrew J. Rider and post to your social media accounts,” she said. The future seems bright for the statue, as it has already proven to be a very successful contribution to the campus. It has heightened school spirit and strengthened Rider’s social media presence. If students haven’t already, they can stop by the BLC and take their own picture with Andrew J. Rider on the bench.